Sealaska Heritage Institute (SHI) has published a workbook for students studying Tlingit that teaches words and concepts through imagery. The volume, Beginning Tlingit Workbook, was written and compiled by Lance (̱X’unei) A. Twitchell, a member of Sealaska Heritage Institute’s Southeast Regional Language Committee and assistant professor of Alaska Native languages at the University of Alaska Southeast (UAS). It is an extension of the landmark book Beginning Tlingit—which was edited by the late linguist Richard Dauenhauer and his wife, Nora Dauenhauer, a fluent Tlingit speaker and scholar, and published by SHI. Beginning Tlingit Workbook is part of an ongoing effort to revitalize Tlingit, and it underscores the commitment of young language learners and teachers to protect the existence of our languages for future generations, said SHI President Rosita Worl. “There was a time when people thought our Tlingit language and the ancient knowledge it embodied would die, but in recent years language learners and teachers, such as Lance, have come out in force to revitalize it. For the first time in many years, we are hearing our language spoken on the land by young people, and that is a powerful thing,” said Worl, noting SHI has posted a free .pdf version online to eliminate any financial barriers that might prevent language students from acquiring the book. ”From the elders who suffered as children when people were trying to kill off our language, to the generation that never had a chance to learn, to the generation that shifted their lives to create space for our language, to the children who are now being raised with our language, we watch this journey come around to a place of hope,” Twitchell wrote in the preface. Twitchell discovered the Dauenhauers’ Beginning Tlingit in 1995 and soon after started studying Tlingit with his grandfather Gooshdehéen Silas Dennis Sr. He began developing the idea for the workbook in 2002 as a Tlingit language teacher in Skagway. 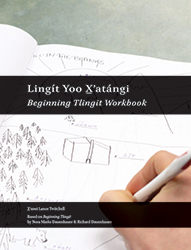 The new workbook is a must-have tool for any student studying the Tlingit language because it teaches Tlingit words and concepts through imagery, Twitchell said. The workbook is based entirely on the teaching methods and steps developed by the Dauenhauers, as well as many other contributors over the years, but it also incorporates some of the ways people today are documenting and teaching various parts of Tlingit grammar, especially verbs. A .pdf version of the workbook is available in the language resources section of www.sealaskaheritage.org and hardcopy versions are available for sale at the Sealaska Heritage Store in Juneau and on the store’s website. The book is also available on Amazon.